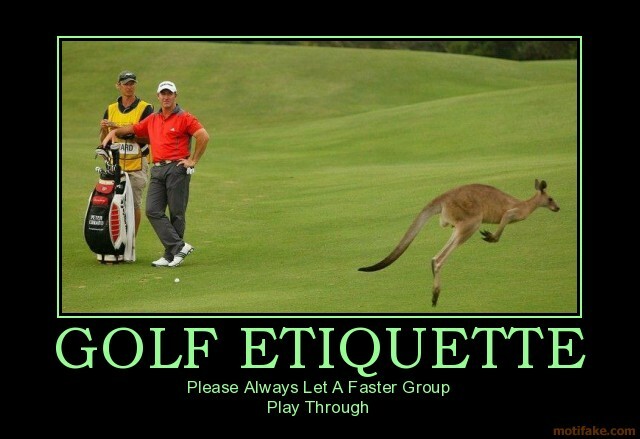 Let’s take a brief pause for the cause to talk about golf etiquette, shall we? Like anything else, golf has its rules. 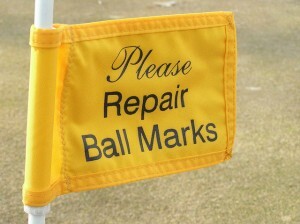 Don’t drive on the greens, repair your ball marks and divots and by all means, let faster people play through. These rules might seem obvious for those who play the game on a regular basis but for those who don’t, problems arise, play slows down and the golf course could get ruined. Even though I started playing golf in my mid-20s, I was fortunate enough to be surrounded by friends, Brotha E, Big Guy, G Mony and the Kosher Bazooka, who all taught me how to properly play the game, not only with bourbon in your cup and a cigar in your mouth, but with respect for the rules of the course. Unfortunately, not every golfer boasts such a keen background. One glorious Florida afternoon, I decided to hit the links by my lonesome in my never-ending attempt to score in the 80s which, once again, I failed to do. After a shaky front nine, with no golfers in front of me and none behind – the glories of mid-week golf in Florida – I finally happened upon a foursome on the 12th green. From afar, I could tell they were hackers, even more so than me, although my recent string of rounds in the 90s might exclude me from that underwhelming group. I sat and waited, and waited, before hitting my approach shot as the four of them finished out their putts. After getting up and down in three strokes, I ran into them, as expected, on the very next tee box. Three of the four had just teed off and the fourth was seconds away from slicing his drive far out of bounds right into somebody’s backyard. Here is where proper golf etiquette comes into play. When a foursome recognizes they’ve got a faster, single golfer behind them, they should allow him to play through, understanding he’ll be up and gone by the time they hit their second shots. At this point, I had a number of options, several of which involved profanity. With the sun winding down, I was hardly about to wait for the Fantastic Four to tally their collective triple bogies before waving me through. Instead, the non-confrontational me decided to drive past them, onto the next hole to continue playing. They looked on in amazement, not realizing that was even an option or perhaps unaware they should have offered that I play through in the first place. That’s what I’m here for. To lend a helping hand to the ill-informed in their time of need. Beginners, please pay attention to the rules of golf. By no means am I a golf snob. I’m as casual as the next guy (probably more so) but the rules are there to ensure enjoyment for all. If you have any questions about these rules, feel free to swing by the USGA’s Etiquette page. Or perhaps you should print this page and present it to the next foursome that doesn’t allow you to play through. This entry was posted in Featured, Life of Sports Chump, Tee Box by Chris Humpherys. Bookmark the permalink. Awesome write-up dude! Jerks like these guys lurk on every green. If you’re a golfer and haven’t it ran into it any guys like this, give it time, you will. Some people just don’t know, Thomas. I guess it’s our job to give back. And wave a friendly, hospitable middle finger while we’re doing so. Hell Chris… What’s 4 against 1? Fist city baby! And may the best duffer win! Look, you’re out there to get some exercise and enjoy yourself then some a-hole gotta play little kid. Treat ’em like little kids and while you’re doing it point out to them that’s just what you’re doing and be sure to call them little kids… That’s almost as much fun as playing a round of golf! Damn that’s crazy! Can’t believe they didn’t let you play thru. You are a better man than me cause when I’m the course and run into people like that I definitely go the profanity route! I guess the only question that remains is… 52, 56 or 60 degree loft on that sand wedge? I could probably take on four guys if I were allowed to have a club in my hand. I can’t say I’ve ever seen a fist fight on the course but hey, I work in a bar so I’m accustomed to these senseless altercations. Seriously, are there that many people out there that don’t know the rules of golf? I’m thinking golf shops should give out free etiquette books with each purchase of a new set of clubs just to protect the rest of us. Somehow, that doesn’t surprise me. Now, if only I could shoot in the 80s. My golfing etiquette tends to get better the closer I get to the nineteenth hole . Jeff Van Gundy is peeved that his brother , Stan , wasn’t hired by ESPN as on air NBA analyst . He event as far to suggest that ESPN was coerced into not signing Stan for an inhouse gig for the outlet . So sad , too bad , ! Who give a #hit to begin with , about Stan The Whiner Van Gundy ? 1:52AM EDT October 23. 2012 – Networks pay millions, even billions, to show games from marquee leagues. But are they essentially just ad agencies at the beck and call of those leagues? Sometimes it seems like it. Jeff VanGundy, ESPN/ABC’s lead NBA game analyst, suggests his brother Stan’s failure to land a studio analyst role at ESPN raises big questions about whether ESPN’s NBA coverage can be reasonably independent. Game 7 last night , did the Cardinals turn up or not for that game ? I could’ve sworn that Cardinals’ hitting coach Mark McGwire was ready to suit up and pinch hit for someone ! LO,LOL ,LOL !!! It’s not easy being “cheesy” , so what’s up with the Boston Red Sox and Boston Celtics ? Stan Van can’t catch a break, huh, Al? That guys been either fired or not hired from more gigs than Larry Brown these days. So we have Tigers-San Fran in the Series, huh? I think I like the Tigers in this one, particularly since they’ll be throwing Verlander 1, 4 and 7. I wanna see what Cabrera and Fielder do when it matters most. Rumor has it that someone is prepared to give Stan a break . I hear McDonalds is still hiring ? No truth to the rumor that McGwire (Cardinals’ hitting instructor) was going to suit up for the Cardinals and pinch hit last night . Would it have made a difference , if he had ? So the Marlins fired Ozzie Guillen ? Oh my Cubans friend in South Miami are extremely happy as they’re arranging a boat to send the former manager down to Havana to visit Raul Castro. Fidel is outside the country at present, undergoing medical treatment . So last night we had Monday Night Football and the third and finals ” Bazza Romney “ debate . Which to your mind was the more boring event ? Also , is has someone made Matt Stafford aware that Calvin Johnson isn’t in the Witness Protection Program . Because he’s nowhere to be seen this season in comparison to last season . Never played “real” golf but did miniature golf and basically the same rules apply. Even with the game, and it is mostly kids, the same things happen. I was also taught bowling etiquette by my parents, and no one knows that now-a-days. The 90’s were a glorious time for the expansion of the game of golf. Unfortunately with that expansion came countless numbers of individuals who have no concept of some of the basic rules of the game. We’ve all encountered similar situations on the course and it peevs me to no end. I do place a large amount of responsibility on the shoulders of the courses themselves for not having marshals aggressively enforce rules. They have a duty to educate the clueless about how they need to be conducting themselves. Most egregious problem to me is the amount of golfers who are playing from the wrong tee box…all those who have to play from the tips or second from to prove that they are “manly” or some crap like that. Yet most idiots can’t even hit the ball 200 yards off the tee. I once complained to a marshal about some such idiots that were holding up an entire course and he explained that under no circumstances who he tell grown men to hit from the ladies tees. I followed that up with a complaint to the head pro who told me the hackers business was more valuable than me and to move along. Brilliant. Looking forward to future editions on etiquette. This is why I keep a 12-gauge in my bag. Sorry that happened to you. They sounded like real jerks. Don’t let anyone spoil yr fun or love of the game. Been on both sides of this situation. 95% percent of the time I will let a single play through if there is nobody ahead of us. If I single starts piping drives within 30 yards of my 2nd shot, I won’t let them play through. Etiquette goes both ways…if you are too much of a coward to kindly ask to play through and prefer to express your displeasure by piping drives at our group… Guess what… You aren’t playing through…. Not sure how I missed responding to all these comments. Sorry about that, guys. Al… In retrospect, with all that’s happened with the Marlins, they probably should have given Ozzie another chance. Look at them now. M… There’s such a thing as bowling etiquette? Does that mean growing a huge belly and ordering a greasy cheeseburger and fries before playing? Oh, and let’s not forget the Lysol spray before putting on each rented shoe. That’s a must. Jed… I do understand that a lot of courses are cutting back, i.e., not employing rangers or starters. I haven’t seen a starter on a course in forever but still, those on the course should still understand the basic rules of the game… or at least read my website to stay informed. Dub… No need resorting to violence when hitting up on them gets the point across just as well. M… Not much spoils my enjoyment of the game, unless it’s someone drinking too much Southern Comfort after throwing back a few Tylenol PM. And agreed, Keeg. I generally don’t hit up on people for fear I might actually tee off on one and hit someone in the group ahead of me. The good thing about golf in Florida in the summertime is that, during the afternoon, there is literally nobody and the golf courses and the green fees are dirt cheap.